At the SLF we think a lot about how to communicate the tremendous impact grassroots groups are having in overcoming the ravages of AIDS. We want our supporters to have confidence in the transparency and accountability of our organization, because it ‘does right’ by the openness and effectiveness of our African partners. You have made an important and significant contribution, and we are eager to provide any and all information that confirms the wisdom of your generosity. As one of our supporters, you know that we shy away from self-congratulatory platitudes, but we are encouraged by every vote of confidence from charity ‘watch-dogs’ because it is further evidence that supporting African communities is not only the right thing to do, but that it’s possible to do it with full accountability. 1. This year, we are one of a select group of charities listed in Imagine Canada’s Holiday Guide to Giving, based on our membership in their rigorous Standards Program, which evaluates charities across 73 standards of board governance, financial accountability and transparency, fundraising, staff management, and volunteer involvement! 2. 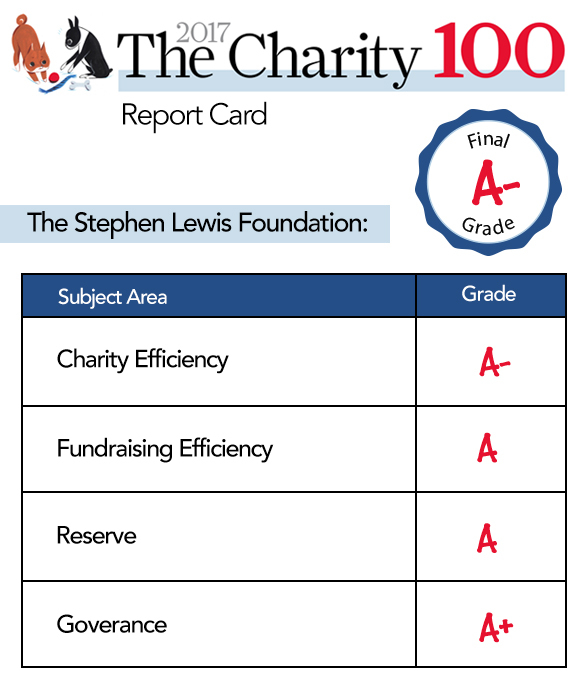 We’re also pleased to share the straight ‘A’s we’ve received from Money Sense Magazine in their annual charity listings for 2017 (see image for full breakdown). and the world's 6th largest funder of HIV/AIDS philanthropy specifically benefiting women and girls. Thank you, again, for your steadfast support. We hope these rankings have helped affirm your decision to stand with us and, more importantly, with the inspiring community-based organizations truly turning the tide of AIDS in Africa.